Goalkeeper Kasper Schmeichel would snub a move to Spanish giants Real Madrid to stay number one at Leicester City, the 25-year-old has said. Having been linked with a move to the world's richest football club, Schmeichel - son of Manchester United legend Peter - has rubbished speculation linking him with Jose Mourinho's Galacticos. "Being mentioned in the same sentence as Real Madrid is an honour but that's as far as I've heard," he told Sky Sports, "I'm very happy here and have a year and a half on my contract where I'm playing week in week out and can't ask for more than that." 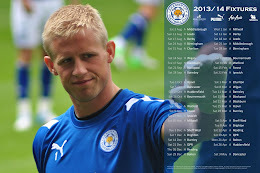 Schmeichel is a man in form, having helped Leicester City to a 100% home record and the top of the Championship season after eleven league games. "Leicester is a very happy place," he added, "I've been very impressed by the set up and the whole way the club has run is very good. We have some great owners who back us and a manager who is very good."